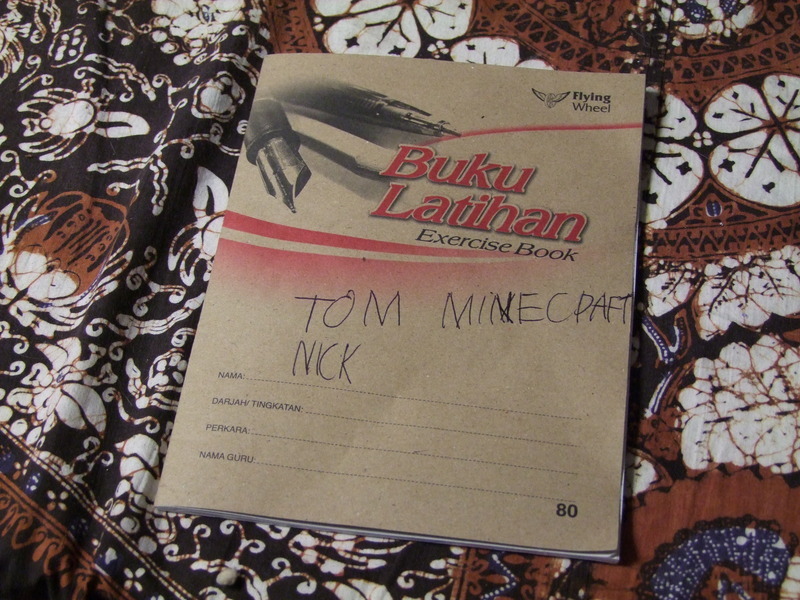 Tom’s Minecraft notebook – Nick. My nephew Tom is really into Minecraft. I’m pretty surprised that he is so into it. Not because I don’t think see how the game would appeal to him, but because he can’t actually play it on his home computer. So the only times that he’s played the game are the few occasions when I’ve let him use my laptop. Despite only playing the game a couple of times, Tom is completely enamoured by the visuals (“Everything is blocky!”) and core game-play concept (“You can make anything you want!”). 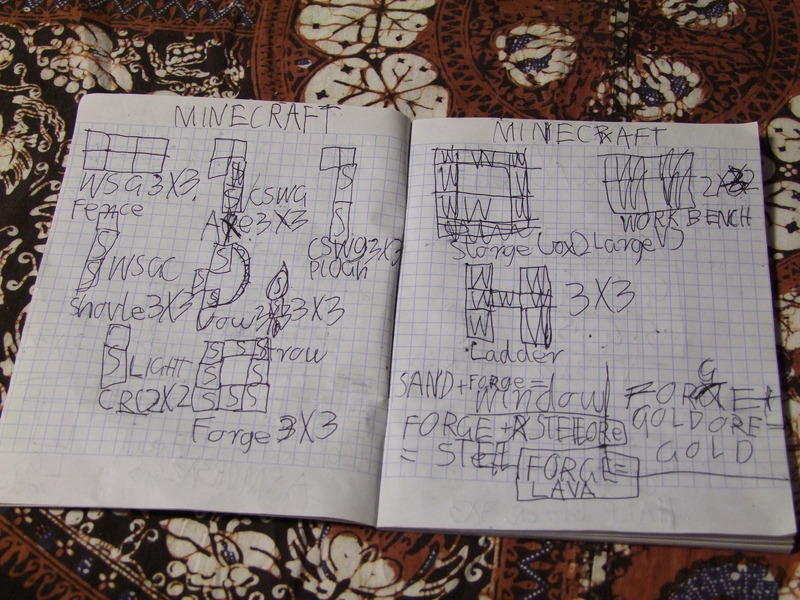 He appears to have spent hours watching Minecraft videos on Youtube in order to learn crafting techniques (in preparation for one day playing the game again). 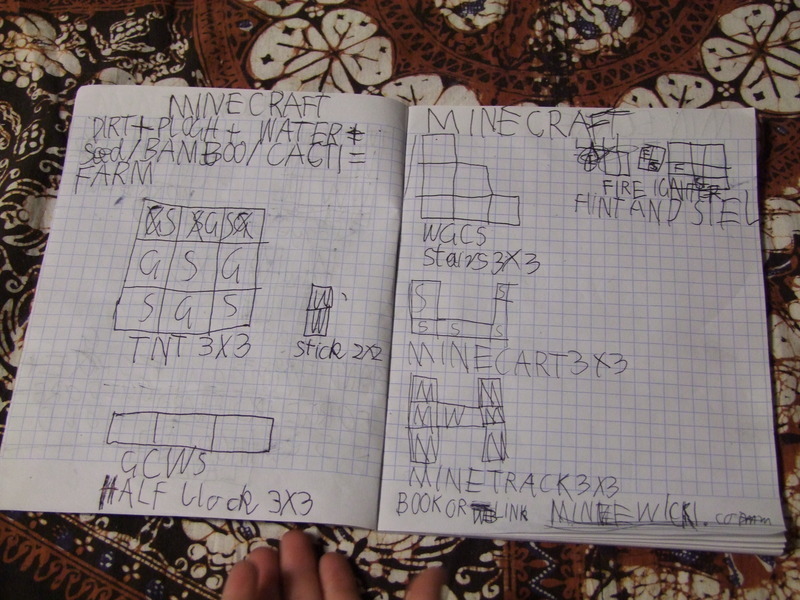 When he had trouble remembering how to make things, he started keeping a journal and filled it with diagrams. I mentioned this to Tom. He said that is one of the things that he may potentially be when he grows up, and that he’s also considering becoming: a scientist, a secret agent. Check out http://sketchup.google.com/ if you don’t already know about it. Pretty simple to use and lets you build whatever you want. Minecraft is a great game for kids, all I remember playing with when I was his age was legos. Ahh the memories. 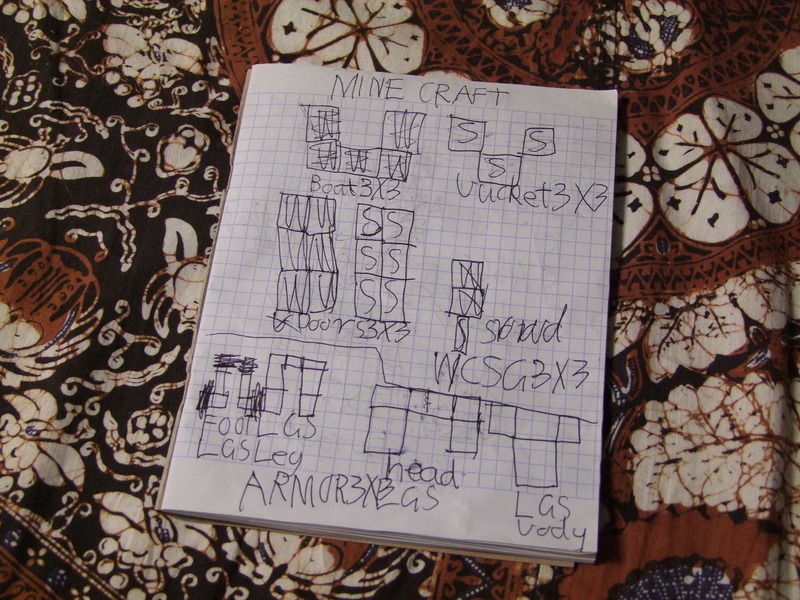 I showed Minecraft to my girlfriend’s son, and he seemed really into it. When I saw him again a few days later, he told me he had been reading crafting recipes and watching YouTube videos. He knew more about the game than I did without ever actually playing it! Things like this make it all the more worth it to be doing what we’re doing at Redstone Wire. I hope Tom enjoy’s his birthday present! US Operations – Redstone Wire, Ltd.
I’m 28 years old with much better things to do with my time, but there is something so brilliant and addicting about Minecraft, as far as i remember, creative mode is just removing blocks and placing blocks, survival mode is what you gain access to when you buy the game, it’s so much more complex, if you want a pickaxe to dig into stone for example, you have to collect wood, craft into sticks, then craft a wooden pick, this enables you to start mining stone which can be crafted into stone picks. You have to then find coal to make torches etc…. As for the Autism comment, it’s a running joke from 4chan’s /v/ board, >implying anyone with the patience to mine materials to build the complex structures must be autistic. there is a way to save in the free creative mode, my 11 year old daughter uses it (obsessively), i cant remember how she did it, but it involved using an option like save file as, or something like that, then saving the actual file to your computer, then loading said file when she wanted to continue.